When producing recombinant proteins, one can follow the purification process either by antibodies detecting the target protein specifically, or by adding a tag to it, thus using antibodies detecting not the protein itself, but the tag. This allows to have a battery of anti-tag antibodies that can be used with any protein, rather than having dozens of protein-specific antibodies. Our experts in recombinant protein production (either E. coli or HEK293) at our laboratories in France, are well aware of the key points in any of these processes. It is not so straightforward to design an anti-tag antibody. One must be sure that it is able to recognise the tag, no matter what protein it is attached to. Here, peptide design and validation with multiple recombinant proteins having the same tag (either in the N-t or the C-t) is crucial. The reason why the anti-tag antibodies we have chosen perform so well in the hands of hundreds of researchers across Europe, is because we select them from sources that really follow this rule when producing their anti-tag antibodies. Anti-tag antibodies facilitate methods of protein localisation, protein topological studies and purification of recombinant proteins. Epitope tags or carrier proteins may be added at either N- or C-terminal ends of the protein-of-interest, which upon cleavage at integrated enzymatic cleavage sites yield pure recombinant protein by removal of the tag or carrier. Performance in WB of Anti-6X His Tag antibody (Cat. No. #039600-401-382). Let’s take a look at the most common anti-tag antibodies, and how they perform, in a series of posts. Recombinant proteins are frequently produced with a poly-Histidine epitope tag to allow for detection and affinity purification. These “HIS-tagged” recombinant proteins may be produced in many different host species including E. coli, insect, yeast, or mammalian cells. The 6X His tag is typically located at either the amino or carboxyl terminus (also called N-terminal HIS tag or C-terminal HIS tag). Our anti-6X Histidine affinity tag antibodies are highly specific to polyhistidine epitope tags used when producing recombinant protein. They can bind to the typical 6X HIS, but some of them can also bind to less frequently used larger 8X or 10X histidine epitopes. Anti-GST conjugated with DyLight 488. The antibody (Cat No #039600-441-200) has been designed to have minimal photo-bleaching. Glutathione S-transferase (GST) is an enzyme that is able to catalyse the conjugation of the reduced form of glutathione (GSH) to xenobiotic substrates during detoxification processes. This feature has been exploited successfully by researchers to use GST as tag protein. Indeed, GST tag consists of 220 amino acid residues that can be fused to the N and C-terminal of the targeted recombinant protein. GST allows the protein to be more soluble, therefore increases its expression level and a proper folding. GST tagged proteins can then bind tightly to glutathione and eluted by competition with reduced glutathione. Antibody anti GST has been generated by immunization with full length GST isolated from Schistosoma japonicum to several hosts that include rabbit, goat and mouse. FLAG™ tag is a short peptide sequence (DYKDDDDK). Because of its small size, FLAG tag does not affect the biochemical properties, transport, or post-translational modifications of the tagged protein or its interaction with other proteins. These properties give scientists valuable tools to study protein expression, modification, localization, transport and the ability to obtain a high yield of purified proteins. The immunoprecipitated FLAG-tagged proteins can be efficiently eluted from the resin under acidic conditions or by competition with the FLAG™ peptide. The purification of FLAG-tagged fusion proteins is performed with mild, non-denaturing buffers. Therefore, FLAG-tagged proteins are recovered without loss of function or loss of activity of the protein. Our anti-FLAG tag antibodies can detect this target in western blot, immunofluorescence, immunohistochemistry and immunoprecipitation with high specificity. When combined with a resin, anti-FLAG allows an easy, fast and high-yield recovery of homogeneous DYKDDDDK-tagged recombinant proteins. Green fluorescent protein (GFP) and Red fluorescent protein (RFP) are ~29 kDa fluorescent proteins used as versatile markers for visualisation of protein localization, monitoring physiological processes and for detecting transgenic or transient protein expression. GFP and RFP can be used for the generation of fusion proteins without significantly interfering with native protein assembly and function, making them powerful tools for in vivo analyses. Cat No #039600-401-379, one of our best-sellers for anti-RFP antibodies. rotein in terms of its overall fold (a β-can) and chromophore-formation chemistry. However, Discosoma red fluorescent protein undergoes an additional steps in the chromophore maturation and obligates tetrameric structure. Using site-directed mutagenesis, a number of DsRed protein variants have been created allowing the red fluorescent protein mature as a monomeric form. Among DsRFP monomeric variants are monomeric mutant mRFP1, mBanana, mCherry, mHoneydew, mPlum, mOrange, mStrawberry and mTangerine that offer a wide range of fluorescent colors. As our RFP polyclonal antibodies are raised against whole RFP protein of wild type, the polyclonal antibodies are expected to recognize all RFP variant forms. All RFP antibodies have been pre-absorbed to eliminate any potential cross-reactivity to human, mouse and rat serum proteins. The antibodies are also confirmed for non-reactivity to GFP protein. In addition, we performed conjugation of RFP antibodies to either fluorescent dyes, biotin or horseradish peroxidase to further facilitate RFP protein detection and quantification. For ELISA (E) use Biotin Conjugated Anti-RFP (Chicken) Antibody in sandwich or titer ELISA formats. This affinity-purified antibody will yield excellent signal to noise ratio when used in combination with streptavidin peroxidase. For Western Blotting (WB) use Peroxidase Conjugated Anti-RFP (Rabbit) Antibody for colorimetric substrate and chemiluminescent substrate detection. Use our blocking buffer to reduce background and to enhance sensitivity. For Immunofluorescence Microscopy (IF) use Fluorescein Conjugated Anti-RFP (Rabbit) Antibody. This antibody will recognize all forms of RFP variants and is ideal as a general use anti-RFP antibody for fluorescence based immunoassays including FLISA. For Immunohistochemistry (IHC) use Peroxidase Conjugated Anti-RFP (Rabbit) Antibody. HRP conjugates can be used in combination with MaxTag™ DAB tablets for immunohistochemistry. More to come, so stay tuned for the next and final post of this series! Cat. No. #039600-401-384 detects HA tagged recombinant proteins by IHC on formalin fixed paraffin embedded tissue. 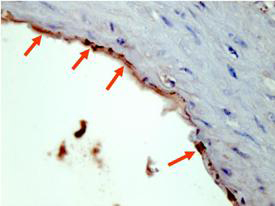 Arrowheads point to expression of HA tagged proteins in endothelial cells of mouse aorta. The selection and variety of available tags is huge, including more classical ones such as biotin, and others such as HA, cMYC, V5 and MBP. Fluorescent molecules such as Fluorescein, Cyanine or Rhodamine are usually conjugated to specific antibodies for integration into platform-specific assays. 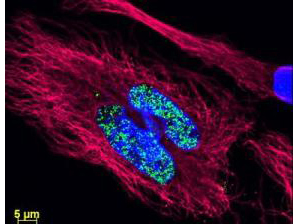 These fluorescent molecules are used in the cell labeling process; however, antibodies raised against them are employed for tag detection and signal amplification. Don’t hesitate to contact us for advice on the most suitable tag to use for your experiment!